Today Jane Anson twittered about Emma Thompson's wine cellar. So I read that in her dream cellar the Meursaults from Arnaud Ente would not be missing. Quite an unequivocal statement. Yes, I import Ente's wines, since last summer, in The Netherlands. In England Ente is imported by Berry Bros. & Rudd and the wine is better known there; here I still have to do some missionary work, and a publication like this is... supportive. Another interesting article I came across was retweeted by Amy Atwood: about the relativeness of wild yeasts. There's much to do about using wild yeasts or industrial yeasts, and this Los Angeles Times article at least puts things a bit in perspective. Any personal adventures this week? Yes, I attended a lovely dinner organised by Christie's Amsterdam. This weekend a big private collection was brought under the hammer, and Friday some lucky dogs were invited to sample about 50 wines from this interesting collection. In my previous posting I wrote about Anne Gros, and Friday the - simple - red Burgundy 2002 was one of the wines to taste. A good vintage, but still I was surprised by the sheer energy of this wine. Pure, lenient, healthy and balanced, and strikingly youthful. Towards the end of the evening I went back to this wine (definitely not the eye catcher of the evening), and shared it with my neighbour. Her plan was to bid on this wine, with the idea to split the lot between the two of us. At the time of writing this I don't know yet if I will be the new owner of some 2002's and 2005's (part of the same lot). The most lovely wines that I tasted were the Buisson Renard 2005 from Dagueneau (intense, perfumed, soft, open), the Puligny-Montrachet 1er cru "Les Champs Canet" 2004 from Carillon (velvety, well-balanced, elegant, a modest beauty) and the Corton-Charlemagne 1992 from Bonneau de Martray (vital, convincing, sesame seed, just very beautiful). 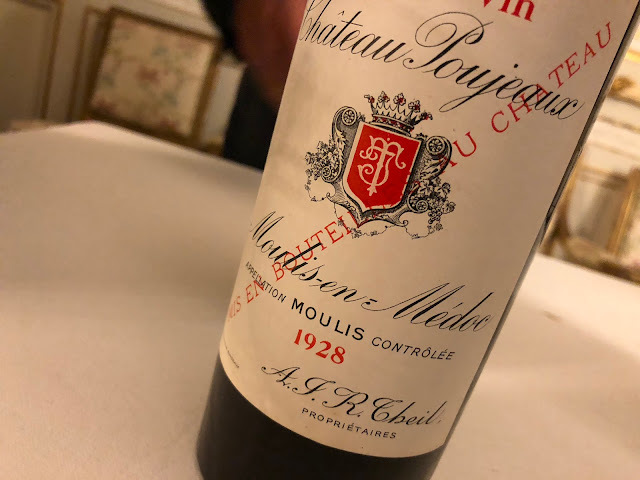 Interesting were some older red Bordeaux's, especially two 1978's: the autumnal La Lagune (a little awkward also, and tannic) and the Haut-Bailly. I just consulted Michael Broadbent's Vintage Wine and his only one 1978 Haut-Bailly (in 2001) wasn't very good. He wonders: "Just the bottle?" and perhaps that might have been the case. What I tasted was an open, rather quiet, harmonious and friendly old Bordeaux. Not impressive, but not bad either.